A couple of good dinners are happening in the coming weeks. If anybody would like a date to any of these, I can make myself available. 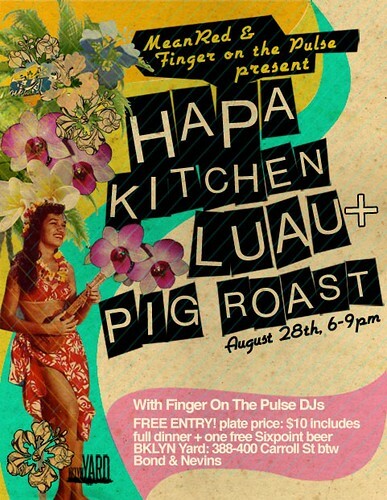 First up, from 6pm to 9pm tomorrow night Hapa Kitchen is going to have a Pig Roast and Luau at BKLYN Yard. For $10, you can get a plate of Hawaiian-themed food served with a seasonal twist care of Garden of Eve, and Tamarack Hollow Farms. That $10 also gets you a Sixpoint. Check out pictures from the June BBQ they threw at BKLYN Yard. If you're feeling a little more high-brow, Just Food and NY Craft Beer Week will be hosting Let Us Eat Local in the Prince George Hotel Ballroom on September 16th from 6pm to 10pm. 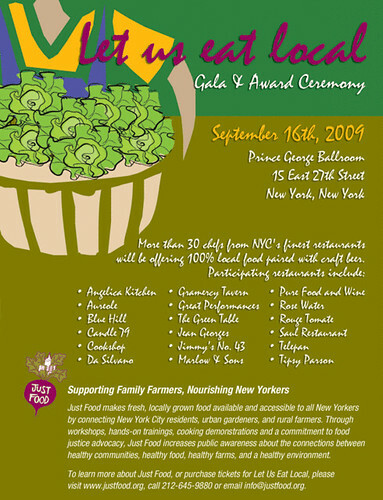 "More than 30 chefs from NYC's finest restaurants will be serving up 100% local food paired with local craft beers," all while handing out the McKinley Hightower Beyah Awards. McKinley Hightower-Beyah was a community activist and urban farmer who grew and sold local, nutritious fruits and vegetables in poverty-stricken South Queens-for more information on him, please click here. The awards set up in his honor are given to those following in his footsteps. Early bird tickets to this have sold out, but tickets are still available. Go to NYCharities.org to get your seat.